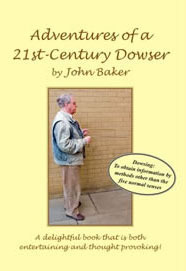 If you know nothing about dowsing (divining) and care even less, you will be in the same position as the author of this book who discovered an ability to dowse by pure chance. This event provoked a curiosity about this fascinating phenomenon which led him on an adventure to discover more about the subject. By trial and error the journey took him into many intrigueing situations, meeting a whole range of characters and personalities along the way. Easy to read with some enjoyable disasters, this book will introduce you to a whole new world which is accessible to everyone. John has appeared on several television programmes, Sissinghurt – National Trust property BBC2 & BBC 4, Sky and Jane Goldman Investigates on the Living Channel. Also ‘Impossible’ on Channel 5. 19, Cecil Court off Charing Cross Road WC2N 4EZ.